Last August a Boston police officer aggressively confronted a man who was recording law enforcement on a public street. Tomorrow, a judge will decide whether to continue the case against a journalism student charged with illegal wiretapping for calling BPD about the incident and recording his conversation. The judge will also decide whether to drop charges against a blogger who wrote an article supporting the student. Taylor Hardy called BPD headquarters for comment after he saw a video of officers forcing a man to leave the area of an investigation. Hardy recorded his call to Boston Police Spokesperson Angelene Richardson, and later posted the recording to YouTube. Hardy’s curiosity as to why the officers asked the man to leave is hardly surprising, as courts have repeatedly reaffirmed citizens’ right to record police on public property. Yet Hardy’s call didn’t yield much, as Richardson said she hadn’t heard about the run-in with the cameraman. Despite this, when police found the recording of the seemingly innocuous call on Hardy’s YouTube channel, they slapped him with an illegal wiretapping charge. Richardson claimed he hadn’t asked her permission before recording their conversation (it is illegal to record another person without consent under Massachusetts law). Hardy says he had consent, but could face five years in prison if convicted. Photography advocate Carlos Miller wasn’t happy when he heard about Hardy’s ordeal. Hardy first saw the recording of police on Miller’s website, Photography Is Not A Crime, where Hardy works as a part-time employee. Miller responded by writing an article calling for BPD to drop the charges. He also asked others to join him, and published Richardson’s office email and phone number in the post. BPD responded to by filing a criminal complaint against Miller for witness intimidation, claiming he had gone too far by posting Richardson’s contact information. NPPA President Mike Borland said he’s astonished that it has come to this. In a statement this morning, the Newspaper Guild- Communication Workers of America joined those demanding Boston Police drop all charges. A magistrate judge will decide Thursday whether there is probable cause to continue the cases against Hardy and Miller. It isn’t clear that the charges against Hardy will be dropped, as he didn’t capture Richardson’s consent on tape. However, the state does carry the burden of proof, so it will need to produce evidence that Richardson didn’t know she was being recorded. The NPPA will continue to shed light on instances where police, due to ignorance of the law or otherwise, refuse to respect photographer’s rights. Borland added “The NPPA offers to help educate the Boston PD so every officer will know the public’s rights to photograph and record police activity. Carlos Miller reported yesterday that a Boston Police attorney asked for a continuance of the hearing until next Friday 11/22/13. ‘Misappropriation’ Art or Transformative Fair Use? It’s Complicated! In the ongoing copyright infringement case by photographer Patrick Cariou against “appropriation artist” Richard Prince, both sides have filed briefs respectively supporting and opposing the August 21, 2013 petition for a writ of certiorari filed by Cariou, appealing the April 2013, ruling in the case by a three judge panel of the United States Court of Appeals for the Second Circuit. That decision reversed and vacated a 2011 lower district court order involving the application of the fair use doctrine to artistic works. 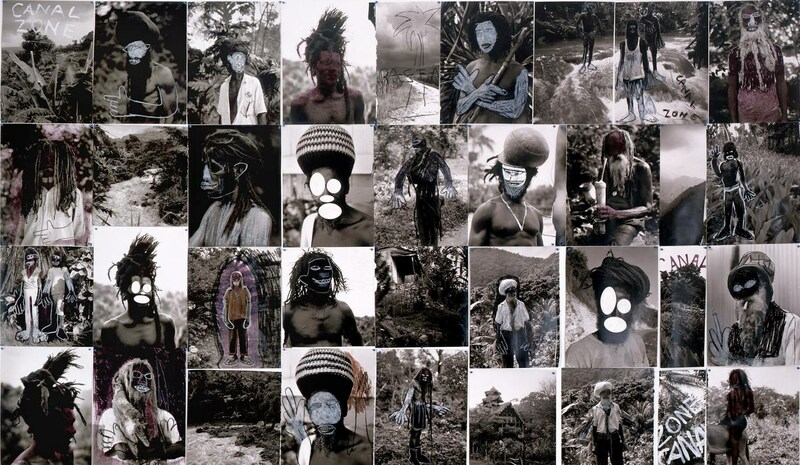 Cariou originally published his photographs in 2000 in a book entitled Yes, Rasta, while Prince’s work was exhibited in 2008 as Canal Zone collages. In his petition to the Supreme Court, Cariou argued that the Second Circuit ruling placed too much emphasis on whether Prince’s works could “reasonably be perceived” by the judges as transformative rather than properly balancing the traditional four factors involved in determining fair use. In that ruling the majority held (with a dissent in part by one of the judges) that the use of copyrighted photographs “as raw material” in creating new “artistic” works may be considered “transformative” fair use even when such works do not “comment . . . on aspects of popular culture closely associated with” the photographs or the photographer who took them. Cariou v. Prince, 714 F.3d 694 (2d Cir. 2013). But the Court of Appeals disagreed with the lower court analysis of the fair use factors and found that whereas “the district court imposed a requirement that, to qualify for a fair use defense, a secondary use must ‘comment on, relate to the historical context of, or critically refer back to the original works,’” they believed the proper determination is “if ‘the secondary use adds value to the original – if [the original work] is used as raw material, transformed in the creation of new information, new aesthetics, new insights and understandings” (Internal citation omitted). They also found that “for a use to be fair, it ‘must be productive and must employ the quoted matter in a different manner or for a different purpose from the original’” (Internal citation omitted). With regard to the transformative nature of the work, the court thought it also critical to determine how the work in question may be reasonably perceived by the reasonable observer as compared with the original work. Court watchers believe that the odds of the high court taking this case are slim because no split decisions exist among the other circuit courts regarding fair use. The other factor that mitigates against the court granting the petition is the argument by Prince that the Appeals Court decision is consistent with the Supreme Court precedent on fair use established by Campbell. Fallout from a prank associated with the tragic Asiana airlines crash is teaching a valuable lesson about copyright law and the fair use defense. But even before authorities could clear the wreckage of Asian Airlines Flight 214, whose crash claimed the lives of three and left more than 180 injured, the story had taken a different turn. Duped by an intern intent on playing a tasteless prank, KTVU in Oakland, California aired a list of names purported to be those of the pilots of ill-fated flight. It quickly became clear that the list was nothing more than a racist joke. Hundreds of YouTube videos of KTVU’s snafu sprang up in the hours following the incident. Obviously not anxious to see its gaffe immortalized, and concerned about the insensitive nature of the prank, KTVU filed “takedown notices” under the Digital Millennium Copyright Act in an attempt to suppress the content. A DMCA takedown notice is a tool that allows the owners of digital content to request that a website operator or internet service provider take down media displayed without the owner’s permission. If a website operator complies with a take down request, they are immunized from any legal action arising from the material in question. This provides a substantial incentive for websites to defer to takedown notices. The DMCA takedown notice is a remarkably effective tool for any creator of content to protect their work-product. Its prolific use is evidence. Google reports receiving more than 14 million DMCA copyright removal requests in the past month alone. So why does a YouTube search of KTVU still yield dozens of clips of the Asiana Airlines debacle, many of those clips with millions of views? It has to do with the way those clips are being used. Copyright law allows the free use of a protected work for criticism, comment, news reporting, teaching, scholarship, or research. So while the KTVU news clip is copyrighted content, those who want to voice an opinion on the situation by posting it to their YouTube account are entitled to do so. The idea is to balance the author’s right to compensation for their work against the public interest in the spread of ideas and information. In this case, people were clearly more interested in poking fun or expressing anger at KTVU than in profiting from the stations’ copyrighted content. Given the digital photograph’s vulnerability to online misappropriation, professional photographers should be particularly aware of the fair use defense. More often than not it will be the foundation of any defense to DMCA takedown notice, and in the case of legitimate fair uses, it will overcome the photographers claim of copyright infringement. 4) the effect of the use upon the potential market. The Stanford University Libraries have put together an excellent in-depth analysis of the four factors, and Columbia University’s checklist can help in the initial evaluation of a fair use defense. If you believe your work-product has been illegally used online and want to file a takedown notice, this quick guide explains the basic steps to putting together a claim. NPPA General Counsel Mickey Osterreicher says Detroit Police may have violated a local news photographer’s rights when they arrested her after she attempted to film officers on a public street. In a letter to Detroit Police Chief James Craig today, Osterreicher also expressed concern over the unlawful seizure of Mandi Wright’s iPhone. “Alleged behavior that chills free speech and violates protections against unreasonable search and seizure under color of law is of great concern to us,” Osterreicher said, adding that the apparent disappearance of Wright’s SIM card was equally troubling. The man, purported to be a plainclothes DPD officer who never identifies himself in the video, confiscated Wrights phone after a brief struggle. Wright was then arrested. She says at the time, she had no idea the unidentified man was law enforcement. DPD says an internal investigation into the circumstances surrounding the arrest is ongoing. Wright has not been charged with a crime. The NPPA has offered to help the Detroit Police Department develop reasonable and workable policies, practices and training in order to avoid similar situations. For more on the importance of the right to photograph in public, read this article written by Osterreicher and recently published in the National Sheriff Association Magazine. He also presented a training session at their national convention in Charlotte, NC about the importance of the right to photograph and record in public.